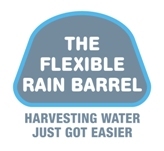 The tank is the most expensive component of a rainwater harvesting system. This is true whether the tank is above ground or below ground. Consequently, many people opt to undersize the tank in order to save money. Fortunately, there are alternatives to solid-walled tanks that can reduce the cost of a system. Passive systems have no tank and are always a good place to start; however, not all properties are conducive to passive systems. Furthermore, if you need to hold water for a period of time (e.g., if you have fruit trees or a garden to water in dry summer months), a passive system won’t be sufficient. You will need some device to store water. Bladders, sometimes called rain pillows, may be a rain storage option. Bladders are often installed in culverts and other metal tanks, but these devices have evolved and can now be designed, manufactured and installed as freestanding devices. These rainwater “tanks” require some protected space away from the direct sun and rodents, and are perfect for a crawlspace or other areas that are protected from the elements. Bladders can be freestanding with no need for a rigid container, which greatly reduces the cost. Furthermore, bladders can oftentimes be installed in a location where a tank can’t be (e.g., under an existing house).Bladders can be designed in sizes ranging from hundreds of gallons to thousands of gallons, and their dimensions are flexible — they can be designed as a long oblong tube or a square flat pillow. Most bladders are custom-made for the exact dimensions required for the installation. Warranties vary from one year to 10 years depending on the manufacturer and type of material used. Many bladders are available with a lifetime warranty on the seams and can be used for both potable and non-potable applications. Cost, flexibility in sizing, and ability to be installed in hard-to-get-to locations are a few of the advantages of bladders. While they may not always be an option — sometimes there is no good installation site — they should be considered as a viable option when first planning a rain harvesting system. Bladders can save you money and offer years of carefree rain catchment.